The Montreal-based FAQ Circus will be in Troy February 20-21 for three performances in the former Troy Gas Light Company gasholder building. Tickets for the performances are $15 / $10 students, and they're on sale now. Contemporary costumes will resemble what one would need to wear if running away -- not too tight, not too loose, Marquise said. 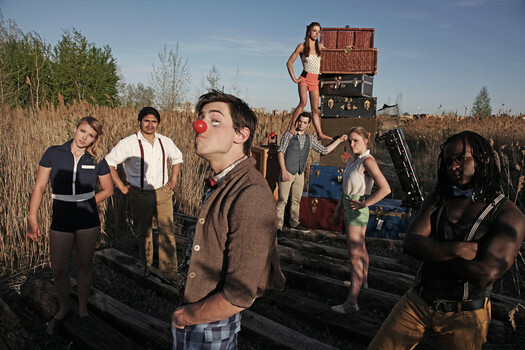 The show will feature hoop diving, acrobatics, juggling, hula hoops and a clown. One performer will manipulate her body using a "German Wheel," fashioned from two giant metal hula hoops. Another act includes an acrobatic ladder. The emphasis in "Running" will be on ground acts, because the gasholder building is not outfitted for trapeze rigging at the moment. FAQ will be offering a three free preview shows this Saturday, February 7, in the Frear Building atrium at 10:30 am, 11:45 am, and 1 pm. Circus or no circus, the Gasholder Building is a sight to see. And noted about the performances there February 20-21: "This is a standing event. However, if you require or prefer seating, please bring foldable seating and aim to arrive at least 30 minutes before the show starts. 'Running' is performed inside a minimally heated historic venue. It is STRONGLY advised that attendees dress in warm winter clothes. (i.e. hats, scarves, gloves, large jackets, long-johns, etc.)."